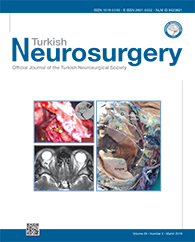 1University of Health Sciences, Gulhane Faculty of Medicine, Department of Anatomy, Ankara, Turkey DOI : 10.5137/1019-5149.JTN.22126-17.2 AIM: To evaluate the existence of nerve innervation of the triceps brachii muscle via the ulnar nerve and its clinical importance in terms of nerve transfer or susceptibility to iatrogenic injuries during surgical procedures. MATERIAL and METHODS: Thirty-five skeletally mature upper extremities of adult cadavers were included in the present study. The ulnar nerve was revealed from the medial cord to the distal part of the cubital fossa. The existence of the branches of the ulnar nerve and communicant branch of the radial nerve was examined in the brachium. The diameter and length of the variant nerve branches were measured. RESULTS: A nerve branch from the ulnar nerve to the triceps brachii muscle was found in five of the dissected extremities (14.7%). The mean length and diameter of the variant nerve branch were 20.2 mm and 1.46 mm, respectively. The mean distance of the muscle entry point of the variant nerve branch from the bi-condylar line was 8.18 cm.